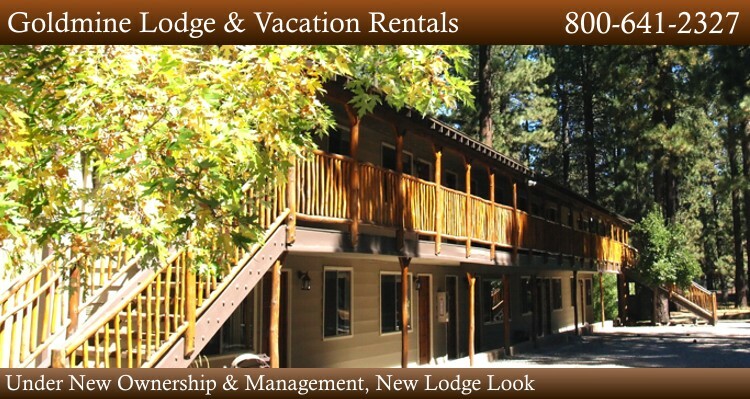 We are proud to announce that as of June 2011 The Goldmine Lodge is under new ownership and management! Each room is tastefully decorated in Boutique Style to a special mountain theme, a perfect retreat after an active day. If it is a Quiet cozy private cottage your heart desires, we have those too! Black Bear Cottages are just a block away. Set midst tall serene pines, they sleep from 2 to 6. Some are even equipped with Romantic indoor Spas! Big Bear Lake is an ideal location for the active vacationer. During both Winter and the Summer, there are special things to do. Please click on our "Calendar of Events" or "Things to Do" in Big Bear buttons to learn of the many things to do in Big Bear Lake. Winter brings all of the snow activities including skiing and snowboarding. Summer invites for play on the lake, hiking, biking, off-roading. Big Bear is host to many special events throughout the year. There is so much to do in Big Bear! To name a few shopping, skiing, snowboarding, shopping, hiking, Cowboy Gatherings, chili cook-off, shopping, parade attending, Logger's Jubilee, shopping, Heritage Days, Antique Car Show, Renaissance Faire, shopping, Jazz Festival, Film Festival, Oktoberfest, the zoo and museum and much much more! Did we mention shopping? We cater to Family gatherings, Corporate and Church Retreats. The Weddings and Reunions held at the Lodge are indeed very memorable. Please check out our Rooms and Cottages. We are certain you will find accommodations that will suit your occasion and tickle your fancy.